This article is about the former city in the former Metropolitan Toronto, now the current City of Toronto. For other uses, see North York (disambiguation). North York is an administrative division in Toronto, Ontario, Canada. It is located directly north of Old Toronto, between Etobicoke to the west and Scarborough to the east. As of the 2011 Census, it had a population of 655,913. It was first created as a township in 1922 out of the northern part of the former city of York, a municipality that was located along the western border of Old Toronto. Following its inclusion in Metropolitan Toronto in 1954, it was one of the fastest growing parts of the region due to its proximity to Old Toronto. 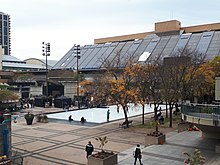 It was declared a borough in 1967, and later became a city in 1979, attracting high-density residences, rapid transit, and a number of corporate headquarters in North York City Centre, its central business district. In 1998, North York was amalgamated with the rest of Metropolitan Toronto to form the new city of Toronto, and has since been a secondary economic hub of the city outside Downtown Toronto. North York skyline in May 2009. Location of North York (red) within the rest of Toronto. The Township of North York was formed on June 13, 1922 out of the rural part of the Township of York. The rapidly growing parts of the township remained in that township. 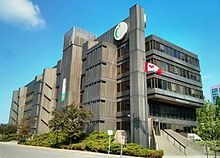 As North York became more populous, it became the Borough of North York in 1967, and then on February 14, 1979, the City of North York. To commemorate receiving its city charter on Valentine's Day, the city's corporate slogan was "The City with Heart". It now forms the largest part of the area served by the "North York Community Council", a committee of Toronto City Council. 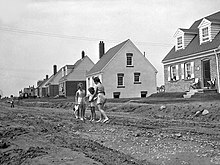 Residences in North York, August 1945. The post-World War II era saw a boom in residential development throughout North York. On August 10, 2008, a massive explosion occurred at the Sunrise Propane Industrial Gases propane facility just southwest of the Toronto-Downsview Airport. This destroyed the depot and damaged several homes nearby. About 13,000 residents were evacuated for several days before being allowed back home. One employee at the company was killed in the blast and one firefighter died while attending to the scene of the accident. A follow-up investigation to the incident made several recommendations concerning propane supply depots. It asked for a review of setback distances between depots and nearby residential areas but didn't call for restrictions on where they can be located. On April 23, 2018, one of the deadliest attacks in Toronto's history occurred in the North York Centre area, in which a van intentionally hit pedestrians along Yonge Street from Finch Avenue to Sheppard Avenue. The attack resulted in 10 deaths out of a total of 26 people getting hit. The suspect was arrested uninjured after attempting to provoke a police officer to kill him. The incident is the deadliest vehicle-ramming attack in Canadian history. There are plans to erect a permanent memorial in North York Centre to honour the victims of the attack. The Bathurst–Steeles area of Westminster–Branson holds the largest percentage of foreign-born immigrants in North York. The neighbourhoods of North York are highly diverse, inhabited by people of many different cultures. The North York neighbourhood with the largest percentage of immigrants in is the Bathurst–Steeles area of Westminster–Branson, where 73% of its population were not born in Canada. Furthermore, the neighbourhood of Parkway Forest has the highest percentage of recent immigrants in all of the Greater Toronto Area, with almost 1 in 4 residents (24%) arriving in Canada less than 5 years ago. As a result, the visible minority population in North York has been growing rapidly. Some of the neighbourhoods with the largest percentage of visible minorities in North York include the Yorkwoods-Driftwood area in Jane and Finch at 95%, the Weston-Finch area in Emery at 91%, the Driftwood-Shoreham area in Jane and Finch at 88%, and the St. Dennis-Rochefort area in Flemingdon Park at 87%. Chinese cultural groups dominate the central and east end of North York that is north of Highway 401 from Yonge Street to Victoria Park Avenue. 31% of the residents in the Don Valley North electoral district are of Chinese descent, and the neighbourhood with the largest percentage of Chinese Canadians in North York is the Aspenwood-Cliffwood area in Hillcrest Village at 58%. Parts of the neighbourhood of Amesbury holds the largest percentage of Black Canadians in Toronto. Black Canadians are most prominent in the west end of North York, especially along Jane Street and the areas nearby. Most are from the Caribbean, but there is also a large African population with many Ghanaians, Somalis, and Nigerians in certain west end neighbourhoods. The Jane & Wilson neighbourhood has the largest Ghanaian community in Toronto. The two census tracts/neighbourhoods with the largest percentage of Black Canadians in all of Toronto are located in North York with the Black Creek–Martha Eaton Way area in Brookhaven-Amesbury at 48%, and the Yorkwoods–Driftwood area in Jane and Finch at 47%. North York has large South Asian communities in Flemingdon Park and Emery, with the latter having a large Pakistani and Sikh population. The neighbourhood with the largest percentage of South Asians in North York is the Gateway–Glenway area of Flemingdon Park at 47%. Filipinos are the fastest growing community in North York, and is already home to the largest Filipino community in Toronto. There is a presence of Filipinos in both west and east ends of North York, however the centre of Toronto's Filipino community is located at Bathurst and Wilson, unofficially known as "Little Manila". This area also hosts every summer the "Taste of Manila", which is the only Filipino street festival in Toronto. One of the longest running community centres, the Kababayan Multicultural Centre, is located near Bathurst and Finch. The census tract/neighbourhood with the largest percentage of Filipino people in North York and all of Toronto is the Neptune area in Lawrence Manor at 37%, followed by the Branson area of Westminster–Branson at 34%. Storefronts in North York offering Iranian cuisine. North York holds the largest population of West Asians in Toronto. North York consists of the largest West Asian population within the City of Toronto, as Iranians have a distinctive presence on the north end of Yonge Street. The largest Afghan community in Toronto is located in Flemingdon Park, and there are smaller, but growing communities of Turks in the Keele-Wilson area of Downsview, and Armenians in the Graydon Hall area. The neighbourhood with the largest percentage of West Asians in North York is on the east side of Yonge and Steeles in Newtonbrook at 21%. Latin Americans in North York are predominantly in the west end of North York along Jane Street, Weston Road, and Keele Street. They make up 10% of North York's population west of Dufferin Street. North York's Latin American community is very diverse coming from many different countries such as Ecuador, El Salvador, Argentina, and Colombia. Some neighbourhoods in North York have some of the highest percentages of Latin Americans in all of Canada. The neighbourhoods with the largest percentage of Latin Americans include the Jane-Sheppard and Jane-Exbury areas in Downsview, and the Humbermede area in Emery, all at 20%. North York has the largest Korean community in Toronto, as they are mainly concentrated in neighbourhoods around North York Centre. The ward of Willowdale has a population that is 12% Korean, and Yonge Street between Sheppard Avenue and Finch Avenue has been unofficially known as Koreatown North (north is used in order to distinguish it from the older Koreatown in Old Toronto). The neighbourhood with the largest percentage of Koreans is the Yonge-Finch area of Willowdale at 17%. The area of Yonge Street between Finch and Sheppard Avenue is home to a large concentration of Korean businesses. As a result, the areas is unofficially known as Koreatown North. North York also consists of the largest Southeast Asian communities of Toronto, as they are clustered in the west end of North York, especially along Jane Street. The Southeast Asian community is predominantly Vietnamese, however there is also a presence of Cambodians in the Jane and Finch community. The neighbourhood with the largest percentage of Southeast Asians in North York is the Firgrove-Eddystone area in Jane and Finch at 23%. The Arab population in North York has also grown quickly over recent years. The north-west end of North York has some areas with a large presence of Iraqis and Assyrians, while some areas along Victoria Park Avenue and Don Mills Road also have above average populations of people coming from Egypt, Lebanon, Palestine, and Syria. The neighbourhood with the largest percentage of Arabs in North York is the Victoria Park-Lawrence area in Victoria Village at 14%. The Arab population in this neighbourhood has grown significantly over the last few years because of the hundreds of Syrians that have settled here recently. Although the European Canadian population in North York has been declining over the years with many moving north into the City of Vaughan, many neighbourhoods still show a significant presence. The largest European community in North York are Italians, in which many are homeowners in the west end of North York. In recent years, many Italians have been moving out of North York to Woodbridge, but there are still many predominant Italian communities in North York, with the largest percentage being in the North Park area of Maple Leaf at 42%. Jewish Canadians have a significant presence along Bathurst Street, which has been historically the largest Jewish community in Toronto and still is today. Along Bathurst are many Jewish community services, businesses, and synagogues. Many Jewish Canadians have also moved north of Toronto in recent years, in communities such as Thornhill. The neighbourhood with the largest percentage of Jewish people in North York is the Bathurst-Steeles area in Westminster-Branson at 14%. Russians make up a large percentage of the population along the north end of Bathurst Street between Sheppard Avenue and Steeles Avenue. The Bathurst-Steeles area in Westminster–Branson is sometimes referred to as "Little Moscow", and Eastern European companies such as Lada have had a presence in North York, as well as Eastern European financial institutions such as Bellridge Capital. Recently, many Russians have also moved north into Thornhill. The neighbourhood with the largest percentage of Russians in North York is the Rockford–Fisherville area in Westminster–Branson at 24%. Other large European communities in North York include the Polish in the Caribou Park area of Lytton Park at 26%; the Portuguese in the Glen Long–Caledonia area of Glen Park at 13%; the Slovaks in the Vendome–St. Dennis area of Flemingdon Park at 13%; the Hungarians in the eastern half of Glen Park at 12%; the Ukrainians in the Bathurst–Steeles area of Westminster–Branson at 12%, and the Greeks in the Victoria Village neighbourhood at 9%. Older generation Canadians of British ancestry dominate the southern end of North York from Bathurst Street to the west, Leslie Street to the east, Highway 401 to the north and Lawrence Avenue to the south. These areas are some of the wealthiest neighbourhoods in Toronto. The largest percentage of non-visible minorities in North York is the Caribou Park area in Lytton Park at 83%. North York City Centre is the central business district of North York and is located on Yonge Street, between Finch and Sheppard Avenue. The district's central business district is known as North York Centre, which was the location of the former city's government and major corporate headquarters. North York Centre continues to be one of Toronto's major corporate areas with many office buildings and businesses. The former city hall of North York, the North York Civic Centre, is located within North York City Centre. Downsview Airport, near Sheppard and Allen Road, employs 1,800 workers. Downview Airport will be the location of the Centennial College Aerospace campus, a $60 million investment from the Government of Ontario and Government of Canada. Private partners include Bombardier, Honeywell, MDA Corporation, Pratt & Whitney Canada, Ryerson University, Sumitomo Precision Products Canada Aircraft, Inc. and UTC Aerospace Systems. Flemingdon Park, located near Eglinton and Don Mills, is an economic hub located near the busy Don Valley Parkway and busy TTC routes. McDonald's of Canada and Celestica are located in this area, and Foresters Insurance has a major office tower and Bell has a data centre. The Concorde Corporate Centre has 550,000 square feet of leasable area and is 85% occupied with tenants such as Home Depot Canada, Sport Alliance of Ontario, TD Bank, ESRI Canada and Deloitte. Home Depot's Canadian head office is located in Flemingdon Park. Shops at Don Mills is one of five major shopping malls in North York. North York houses two of Toronto's five major shopping malls: the Yorkdale Shopping Centre and Fairview Mall. Other neighbourhood malls locations include Centerpoint Mall, Bayview Village, Sheridan Mall, Yorkgate Mall, Shops at Don Mills, Steeles West Market Mall, Jane Finch Mall and Sheppard Centre. Health care is another major industry in North York, with the district housing several major hospitals, including the North York General Hospital, Humber River Regional Hospital and the Sunnybrook Health Sciences Centre. Headquarters of the Toronto District School Board in North York. All four Toronto-based public school boards are headquartered in North York. Four public school boards operate primary and secondary institutions in North York, Conseil scolaire catholique MonAvenir (CSCM), Conseil scolaire Viamonde (CSV), the Toronto Catholic District School Board (TCDSB), and the Toronto District School Board (TDSB). CSV and TDSB operate as secular public school boards, the former operating French first language institution, whereas the latter operated English first language institutions. The other two school boards, CSCM and TCDSB, operate as public separate school boards, the former operating French first language separate schools, the latter operating English first language separate schools. All four Toronto-based public school boards are headquartered within North York. In addition to primary and secondary schools, several post-secondary institutions were established in North York. York University is a university that was established in 1959. The university operates two campuses in North York, the Keele campus located in the north, and Glendon College, a bilingual campus operated by the university. There are also two colleges that operate campuses in North York. Seneca College was established in North York in 1967, and presently operates several campuses throughout North York, and Greater Toronto. One of Centennial College's campuses are also located in North York, known as the Downsview Park Aerospace Campus. North York is presently a suburban district of the City of Toronto, and is represented by councillors elected to the Toronto City Council, members elected to the Legislative Assembly of Ontario, as well as members elected to the Parliament of Canada. North York Civic Centre is presently used by North York's community council and other city departments servicing North York. The North York Civic Centre is home to the district's community council, as well as other municipal services. Prior to North York's amalgamation with Toronto in 1998, North York operated as a lower-tier municipality within the regional municipality of Metropolitan Toronto. The municipality operated its own municipal council, the North York City Council, and met at the North York Civic Centre prior to the municipality's dissolution. The following is a list of reeves (1922–1966) and mayors (1967–1997) of North York. Names in boldface indicate Controllers that were or became Mayor of North York in other years. * Booth died in 1970 and was replaced by Paul Godfrey who served out the balance of his term. Godfrey was reelected in 1972, but resigned when he was elected Metro Chairman in 1973 following the death of Metro Chairman Albert Campbell. North York Council elected Alderman William Sutherland to replace Godfrey on the Board of Control on July 23, 1973. **Shiner died on December 19, 1987. Councillor Mario Gentile was appointed to the Board of Control in February 1988 to fill Shiner's seat. North York Mirror: A twice-weekly community newspaper covering North York. Part of Torstar's Metroland chain of community newspapers. Salam Toronto: Bilingual Persian-English weekly paper for the Iranian community of North York. The Aga Khan Museum is one of several museums located in North York. North York is home to several museums including the Toronto Aerospace Museum in Parc Downsview Park. North York is also home to a number of interactive museums. Black Creek Pioneer Village, an authentic nineteenth-century village and a living museum, while the Ontario Science Centre is an interactive science museum, both located in North York. The Aga Khan Museum, includes a collection of Islamic art from the Middle-East and Northern Africa. An aircraft manufacturing facility and a former military base are located at Downsview. With the end of the Cold War, much of the land was transformed into a large park now called Parc Downsview Park. Located within the park is the Downsview Park Sports Centre, a 45,000-square-metre (485,000-square-feet) multi-purpose facility built by Maple Leaf Sports & Entertainment (MLSE), owners of Toronto FC, of Major League Soccer. MLSE invested $26 million to build the Kia Training Ground, the state-of-the-art practice facility for Toronto FC. Volleyball Canada made Downsview Park its headquarters and training facility. Soccer pitch at the KIA Training Ground, the practice facility for the Toronto FC. There are a multitude of sports clubs based in North York including the North York Storm, a girls' hockey league, Gwendolen Tennis Club, and the North York Aquatic Club, which was founded in 1958 as the North York Lions Swim Club. The Granite Club, located at Bayview and Lawrence, is an invitation-only athletic club. In 2012, the club made a major expansion in North York for their members. Several major controlled access highways pass through North York, including Highway 400, Highway 401, Highway 404, Allen Road, and the Don Valley Parkway. The former three controlled access highways are operated by the province as 400 series highways, whereas the latter two roadways are managed by the City of Toronto. The section of Highway 401 which traverses North York is the busiest section of freeway in North America, exceeding 400,000 vehicles per day. A Toronto Transit Commission bus terminal outside of Finch subway station. Public transportation in Toronto is primarily provided by the Toronto Transit Commission's (TTC) bus or subway system. Two lines of the Toronto subway have stations in North York, the Line 1 Yonge–University, and Line 4 Sheppard. Finch station, the terminus of the Yonge Street branch of the Yonge–University line, is the busiest TTC bus station and the sixth-busiest subway station, serving around 97,460 people per day. The Sheppard Subway which runs from its intersection with the Yonge-University line at Sheppard Avenue easterly to Fairview Mall at Don Mills Road, is entirely in North York, averaging around 55,000 riders per day. The intersection of York Mills and Yonge, located next to York Mills Station is home to an office and a TTC commuter parking lot, which was sold for $25 million. A $300-million project is expected to create about 300 jobs and bring a new hotel, perhaps a four star Marriott, to the intersection. In addition to the TTC, other public transit services that may be accessed from North York include GO Transit, and York Region Transit. GO Transit provides access to commuter rail and bus services to communities throughout Greater Toronto. Both services may be accessed at GO or TTC stations located in North York. Rambha, Indian actress, married a Canadian-based Sri Lankan Business man. ^ Queen, Lisa. "Aerospace campus for Downsview Park?". Inside Toronto. Metroland Media. Retrieved March 5, 2015. ^ Arnaud-Gaudet, Nicolas. "Centennial College To Build Aerospace Campus at Downsview Park". Urban Toronto. Retrieved March 6, 2015. ^ "Concorde Corporate Centre". Artis REIT. Retrieved March 15, 2015. ^ North York Storm Official site of girls hockey in North York. ^ North York Astros Men's professional soccer playing in the Canadian Soccer League. Esther Shiner Stadium. ^ Pigg, Susan. "York Mills TTC parking lot slated for hotel, office complex". Toronto Star. Torstar. Retrieved April 10, 2015.